My grandmother died on March 3rd, 1966. The event struck the family like a cue ball smacking hard against the pack, scattering everyone to distant parts of New York State, and then to the far reaches of the country. Heading northwest out of the Bronx, my immediate family began to adjust to the exotic landscape of the suburbs, and to release itself from the grip of the Roman Catholic Church. It was early September, and I was about to turn eleven. My brother was supposed to go into the third grade, but that class at the local Catholic school was filled to capacity, and the only option the administrators there offered my mother was to have him repeat the second grade, joining our younger sister and essentially losing a year of his life. To my continued astonishment, she said no, and sent the three of us to public school, where we were allowed to wear tee-shirts and sneakers, and were at last free to breathe and think and let our beliefs develop on their own. Everything was different. Men came into the classroom, not to bless us or urge the boys to enter the priesthood, but to teach us math and geography and how to say “Where is the library?” in Spanish. Thoughts that the devil was planting bad things in my mind, and that my soul was in danger of eternal damnation, would continue to nag at me. But the door had been opened to unfamiliar ideas and surprising possibilities. I gradually found myself stepping outside of those original teachings, shedding them like an outgrown school uniform, and seeing the world through fresh eyes. With each passing day, Catholicism receded further into the past. But I still recalled some of the things the nuns had put into our heads, things that confused me then, and angered me now. My childhood had been steeped in anxiety, and inadequacy. Jesus, Mary, and Joseph. The twelve apostles. The saints. They had set the bar too high, and I could never measure up. We had been taught that God was everywhere. But so was the potential for guilt, and the likelihood of punishment. One of our nuns had advised us that having dreams during sleep was unhealthy, that our minds should be blank during the night to allow God’s will to find its way in. But the more I strove for clear sleep, the more dreams I had, and the more I worried that Satan had gotten there first. Another nun encouraged us to go out and convert Jews. 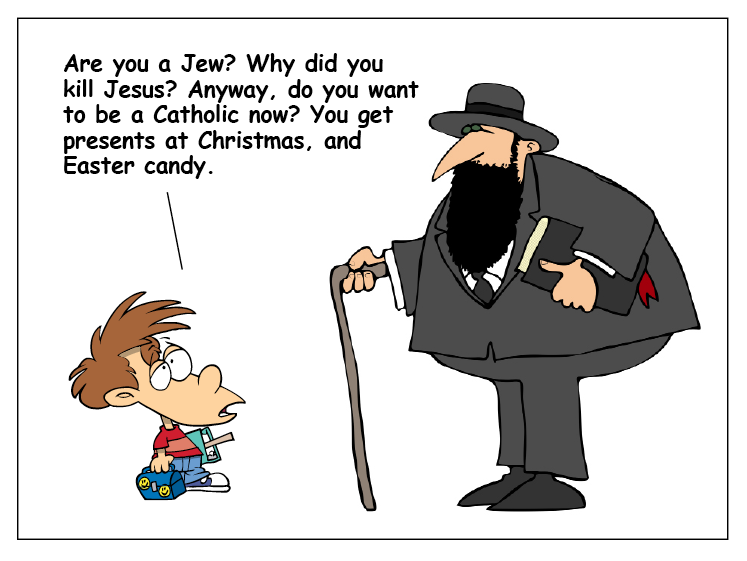 I wasn’t sure what a Jew was, except that a bunch of them had caused Jesus to be crucified, that they later refused to believe he rose from the dead, and because of that they weren’t allowed to celebrate Christmas. As he did with most minorities, my father seemed ambivalent about the Jews, disliking them in general, even while he loved individual members of their group. Yet another nun instructed her fourth-grade students to go home and look inside the front cover of their Bible. “If it says King James,” she told us, “toss that book in the garbage.” Did I hear that right? I walked home slowly that day, a nervous wreck trying to imagine having to convince my parents that we’d somehow ended up with a king’s holy book and that we needed to get rid of it. Ours turned out to be the Catholic version, which was a great relief, but I’ve always wondered what might have happened. Would I even be here, talking to you, had I secretly heaved that massive volume into the trash along with empty tomato cans and yesterday’s newspaper? A month after my grandmother died, the cover of Time Magazine featured just three words: “Is God Dead?” My ten-year-old brain, of course, believed this was a news story — that they’d found his body, were going to explain the cause of death, and possibly announce where the funeral was to be held. I thought the magazine was reporting on God’s actual death, the way they had notified us about William Frawley, the actor who’d played Fred Mertz on the I Love Lucy show. Mr. Frawley also died on March 3rd, 1966, the very same day as my grandmother. But while he rated a short obituary in the magazine’s Milestones section, her death went completely unnoticed in the media, even though it had dissolved the glue holding our entire family together. 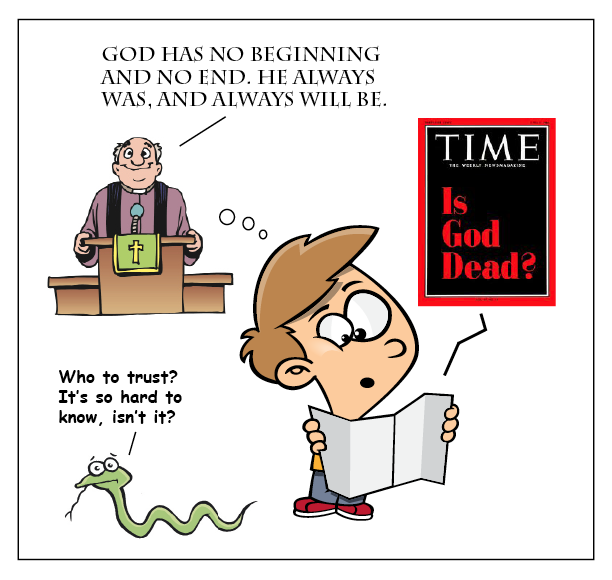 Could God really be dead? The question shook me to the core. I’d never heard anyone ask such a thing. In order to prove his death, wouldn’t we have had to prove he was alive? For that matter, I’d never heard anyone use the word alive to describe God. But maybe I’d been misinformed. Or I’d misunderstood. It wouldn’t have been the first time for either. Meanwhile, a separate part of my brain supplied a well-rehearsed answer: “God always was, and always will be.” The nuns and priests had drilled that into us. I used to sit and ponder the concept. He had no beginning. I’d go back in my mind, before Babe Ruth and before George Washington, and God was there. I’d keep going, to Christopher Columbus, then to the pyramids, and the dinosaurs. God was still there. No matter how far into the past I ventured, God was waiting for me, sometimes with his arms folded across his chest and a look on his face that seemed to say, “What did you expect?” The idea of time stretching endlessly back – and God with it – was maddening. I had to retreat from it, quietly and defeated. Mrs. McGarvey was my sixth-grade English teacher. We were in public school, but she ended every class with the admonition to “Read your Bible!” I remember feeling noticeably detached from her advice, as though it really were my choice to read or not. But the inevitable uncertainty lurked everywhere. Would God know if I decided not to read? And if he were dead, who was going to enforce the rules? In fact, where did that leave the whole system – heaven, purgatory, and hell? Who was everyone praying to? Life had been neat and reliable until that point. If I had a problem or needed comfort, all I had to do was lift my gaze. My grandmother lived upstairs. Fred Mertz lived upstairs. God lived upstairs. 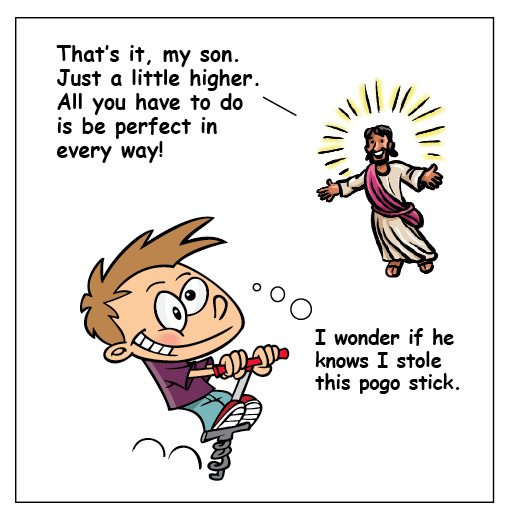 A little boy could count on people like that. Now, apparently, they were gone. Had they all died on the same day? I didn’t know what to believe. But by the time I became a teenager, I knew I was finished with religion.